Congress and JD(S) together have 55-80% votes in eight Lok Sabha seats in this region and under normal circumstances, voting should be a mere formality. But the current trends on the ground are making the alliance partners nervous. Bengaluru: Karnataka has 28 Lok Sabha seats and 14 of them are voting in the second phase of elections this Thursday. Except Shimoga and Davanagere, all the seats in Old Mysore region are voting the same day. Old Mysore is a stronghold of Congress and JD(S) — barring six seats, the BJP is a marginal force here. The arithmetic favours the ruling Congress-JD(S) coalition but the perception seems to favour the BJP. Congress and JD(S) together have 55-80% votes in eight Lok Sabha seats in this region and under normal circumstances, voting should be a mere formality. But the current trends on the ground are making the alliance partners nervous. The BJP is sensing a huge opportunity to breach the Congress-JD(S) fortress and it is leaving no stone unturned to capture the Gowda and Congress bastion in this election. Both Congress and JD(S) are worried about vote transfers to each other. Even though the leaders of the two dominant political parties in the region are campaigning together to ensure victory of their candidates, warring workers of both the parties on the ground are showing no enthusiasm. Upset over the coalition and seat-sharing, both Congress and JD(S) workers are openly campaigning for their common rival BJP in some seats, causing panic in Gowda and Congress camps. Most big guns from Karnataka, including former Prime Minister HD Deve Gowda, his two grandsons, former Union ministers M Veerappa Moily, KH Muniyappa, V Srinivasaprasad, state minister Krishna Byregowda, senior Congress leader BK Hariprasad, film actress Sumalatha Ambareesh and BJP leader Shobha Karandlaje, are seeking Parliament entry in this phase. The ruling coalition is facing a massive revolt in Mandya, where chief minister HD Kumaraswamy’s son Nikhil is making his debut. Miffed Congress workers and leaders are openly supporting BJP-backed independent candidate Sumalatha, whose husband and Congress leader Ambareesh died last November. Mandya is a JD(S) and Congress fiefdom — together they have about 80% of the total votes — and they are moving heaven and earth to ensure Nikhil’s win. The JD(S)-Congress animosity is so high that even when Congress president Rahul Gandhi held a joint rally in the constituency last week, many district Congress leaders stayed away from that event. Some local JD(S) leaders are also upset with the Gowdas for fielding a third-generation member, denying an opportunity to party workers. In Hassan, Gowda’s second grandson Prajwal Revanna is making his electoral debut. Many district Congress workers are up in arms against his candidature and former Congress minister A Manju is taking on him as a BJP candidate. Some JD(S) leaders are also upset with the blatant, brazen family politics of the Gowdas. Prajwal’s father and PWD minister HD Revanna is making all possible efforts to ensure his son’s win. After vacating Hassan for his grandson, Deve Gowda has moved to Tumkur currently held by the Congress. The sitting MP, Muddahanume Gowda, and former Congress minister KN Rajanna are still upset over Gowda’s candidature. The veteran, who is fighting his 16th direct election in his 57-year political career, is struggling to sail through at the age of 85. In Chikkaballapura and Kolar, two former Union ministers — M Veerappa Moily and KH Muniyappa — are also facing a similar situation. The local JD(S) is not too enthusiastic to back them and some Congress leaders are also allegedly trying to sabotage their chances. The BJP, which never won from here, feels that victory is now within its reach and is exploiting the coalition contradictions to its advantage. Even in Mysore-Kodagu seat, Congress candidate CH Vijayashankar is facing a hostile JD(S). Upset over the seat going to Congress, many JD(S) workers are staying away from campaigning, bringing relief to sitting BJP MP Pratap Simha. Former chief minister Siddaramaiah has taken this as a matter of prestige and has even reached out to his arch rivals in the JD(S). The BJP has fielded former Union minister and veteran Dalit leader V Srinivasaprasad from neighbouring Chamarajanagara against sitting Congress MP Dhruvanarayana. Both JD(S) and Congress leaders admit that it is getting tougher for the Congress here as two dominant castes — Lingayats and Upparas — are backing the BJP. 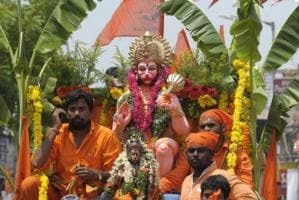 In BJP-dominated Dakshina Kannada and Udupi-Chickmagalur seats, the saffron party is confident of retaining its hold even in this election. In Chitradurga, sitting Congress MP BN Chandrappa is locked in a fierce battle with the BJP’s Narayanaswamy. Only in Bengaluru Rural held by Congress’ DK Suresh, the battle looks completely one-sided as the BJP does not have much support. Almost all agree that Suresh’s win is a foregone conclusion. Surprisingly, only in Bengaluru City, the Congress and JD(S) are fighting the BJP unitedly for the first time. The JD(S) has given all three seats to the Congress in the state capital. In Bengaluru North currently held by BJP’s Union minister DV Sadananda Gowda, Congress has fielded Krishna Byregowda, making it an interesting battle. With his clean image and youth factor, Byregowda is campaigning aggressively to wrest the seat after 15 years from the BJP. In Bengaluru Central, Congress MLC Rizwan Arshad is once again taking on BJP MP PC Mohan. He is hoping that about 40% minority votes in the seat may help him wrest the seat from the BJP after 10 years. Popular film actor Prakash Raj, who is contesting as an independent from the same seat, is causing some panic in the Congress camp. Bengaluru South is witnessing a close fight after 10 years. Senior Congress leader BK Hariprasad is taking on 28-year-old BJP candidate Tejasvi Surya, who replaced late Ananthkumar’s wife Tejaswini in a midnight coup. The seat has been with the BJP since 1991 and the Congress has won only once in 1989 in the last 42 years. Hariprasad is trying to exploit the local BJP resentment against Surya to win the seat after 30 years. He is eyeing about four lakh Vokkaliga votes in the constituency to ensure his win in a tough seat. Surya claims that he will win because of Prime Minister Narendra Modi and BJP. If the vote transfer happens between coalition partners, they can easily win up to 10 seats in this phase. If it does not, the BJP will have a huge advantage. In 2014 Lok Sabha elections, Congress had won six and the JD(S) two seats from this region. The BJP had won six seats, including all three in Bengaluru city.